Check out what Dan Gould has thoughtfully stitched together from Treehugger and 37 signals. Would this pertain to libraries too? The hot trend is to move libraries into the next "third place." I'm doubtful that libraries would or should close. Instead, I say bring on an extra librarian (easier said than done--I can imagine the extra librarian would be at the cost of the other librarian's wages). For the library-as-third-place concept, check out the Idea Store. Making the mundane beautiful...there is no such higher art. I don't promote the use of open encyclopedias like Wikipedia for information that can be obtained through sources that use a traditional editorial process. However, I do promote the use of such sources when they cover what Jimmy Wales terms "the rest of the library." Wikipedia is particularly useful for pop culture subjects. As Wales indicates in a recent article in New Media Age, "there are few highly reliable sources" in this arena. Additionally, institutional wikis and blogs that are selectively open have great potential for the documentation of what would otherwise be tacit knowledge. Nutely,M. (2008). Open to Ideas. New Media Age. Social networks subsidized by advertising and our elected officials make strange bedfellows--or at least that what the policies say. Stefano Maruzzi indicated in his interview with Ed Dorrell (NMA) that his strategy for turning Condé Nast into a profitable digital business revolved around "standardization followed by innovation." Maruzzi goes on to say that in order to innovate, information delivery must be standardized. Of course, libraries have been standardizing information for ages. However, information delivery (OPACs) has been relatively un-innovative because they lacked user-centric designs. That is starting to change. There may also be an argument to the siloing of information within our profession. Maruzzi has the ability to restructure his organization because, in the end, financials all lead to one entity. Publicly open libraries (public and academic [to a degree]) are tied to thousands of city/university purse strings. Still I'd argue that the user doesn't see the library in their hometown as any different than a library halfway across the US. The library is the brand regardless of format. In a comment on using Web 2.0 technologies for higher ed, Rob S. introduces innovation without permission. Following the adage, "It is often easier to ask for forgiveness than to ask for permission," innovation without permission navigates a tricky stance between efficiency, productivity, intellectual property, and privacy. The UK government is turning frustration into empowerment by asking groups and individuals to improve how public information is communicated. 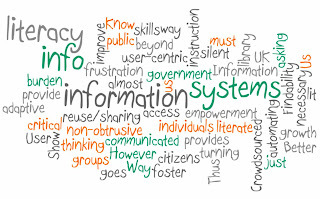 Information literacy goes beyond what the library provides access to. Findability, critical thinking, and adaptive reuse/sharing are just some of the skills necessary for info literate citizens. However, the burden should be on us to provide user-centric systems. These systems must foster info lit growth in a non-obtrusive, almost silent way. Thus, automating information literacy instruction. To make your own video or to spoof a friend, please visit News 3 Online! 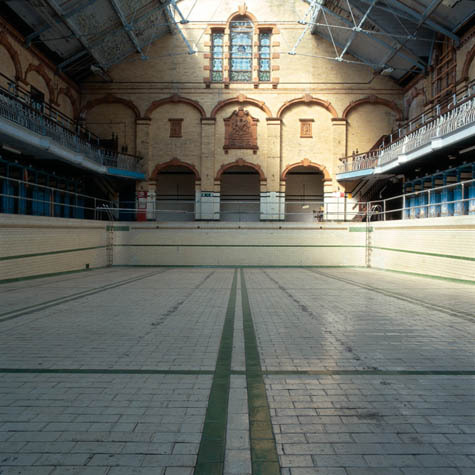 In her "Absence of Water" series, Cifali has masterfully documented the disappearing bath houses and lidos of London. I hadn't visited ALA's Info Island yet, but I read ALA Library Reference Specialist Valerie Hawkins (ALALIbraryVal Miles)'s description and was intrigued. Although I didn't have much time to check it out, it looks promising. I'll report later when I can devote more time. Boursnell has been getting some press for his new book Covent Garden: The Fruit, Vegetable and Flower Market. Now overrun with tourists and the enterprises as well as the design that caters to them, Covent Garden is a shadow of its former utilitarian self. The photographs that I've seen in the Guardian and especially in Design Week are reminiscent of Venice--a connection that is especially strong when considering Venice's history. We gave up on art as being a window into our world a long time ago. Photography, for a short period, took up the slack. Images on a solid medium like paper (photographs) or images displayed via an electronic screen still contain some of their power of authenticity. Pre-photoshop manipulation was an arduous task usually not performed unless you were a professional. Today, authenticity sits precariously on the question is it real or photoshopped. Of course, manipulation is somewhat tricky. Through composition, the photographer manipulates the scene. The camera manipulates color and perspective. Atmosphere manipulates objects. And so forth. However, there is this notion that when we press that button whatever results will be a relatively accurate visual record--sans intermediation. Everything will change with "Image Fulgurators." Ad creep, protesters, and general revellers will find innumerable applications. Imagine ad placements in your photographs. Imagine political diatribes in public squares. Imagine obscenities on public monuments. Sure, these examples may create dialogue, but it does so from a position of stealth. In an age of transparency, I would argue that the above examples are ill advised. Although it is hard not to think about its use in negative terms, maybe there are uses that I've not considered. Maybe we'll stop taking so many darn pictures and become better story tellers--eliminating the overuse* of visual artifacts. Or maybe the practice will allow us to enjoy the moment without being a documentarian.